I just finished listening to the second episode of Season 7 of "Let's Talk Jackson," which is now powered by the Jackson Free Press. In it, we get the second half of Donna Ladd's interview with Benny Ivey, about his life as a Simon City Royal, his road through rehab and recovery, and his current work as a "credible messenger," where he's working locally with Rukia Lumumba (the mayor's sister) and others to reach out to at-risk youth and help them avoid a path of addiction and violence. If you haven't listened to the first episode yet, both are available at jfp.ms/podcast via SoundCloud; you can also subscribe to the podcast via iTunes and Google Play. I'm excited to note that episode 7X01 is already one of the most listened-to episodes of "Let's Talk Jackson," and we're hoping that the show can continue to reach a wider audience as we add new people and topics this season. We've already recorded two more episodes of the podcast—including Donna's interview with south Jackson's newest House member, Ronnie Crudup, Jr., and Amber Helsel's interview with Monique Davis at the Mississippi Museum of Art. We're in the planning stages for quite a few more this spring. Please check it out and let us know what you think—including any guests you want to recommend or topics you'd like us to cover. 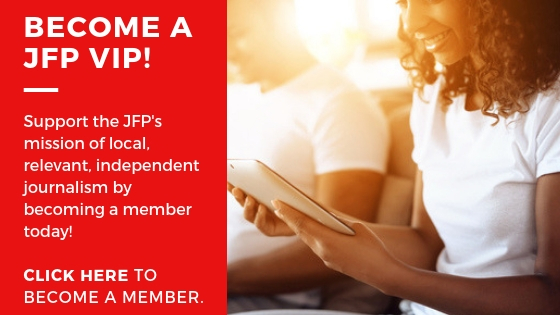 Adding "Let's Talk Jackson" to our arsenal of ways to get the word out in Jackson has been made possible, in part, by everyone who has joined the JFP VIP Club, and we'd like to thank all of our members! 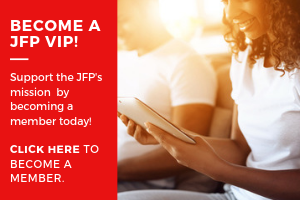 We know the JFP VIP Club doesn't offer all that many direct perks, but we know that many of you appreciate our team's efforts at quality journalism and entertainment coverage for the Jackson metro area—and we appreciate your support. Learn more at jfp.ms/vip. In this issue of the JFP, you'll find our annual coverage of the upcoming Crossroads Film Festival, now in its 20th year. You'll also find the Crossroads official program for the Festival, which takes place largely at the Malco Grandview Cinema in Madison with some supporting events at Hal and Mal's in downtown Jackson. Can you tell I'm excited? As a former board member (and one-time president of the organization), I'm thrilled and proud to see Crossroads Film Festival enter its 20th season as a strong event offering a lot of great opportunities to "go deep" with independent film and filmmaking. Please take a long look at all the coverage (and the program) this issue and make sure you get out to attend April 11-13. I've always thought that Crossroads was a well-timed opportunity to show off Jackson because we've usually got azaleas and other flora and fauna in full bloom for spring—when some places where visitors might be coming from are still getting snow flurries. As spring really does seem to be hitting, we've got some other fantastic things to do while this issue is on the street, including the return of Fondren's First Thursday and the opening of the spring edition of the Four Seasons art show at the Cedars. Friday, April 5, 2019, is the Art Party at the Mississippi Museum of Art—another fantastic venue for spring-time events and entertainment (if the weather cooperates), and Sante South is coming up this weekend at Renaissance in Ridgeland. What else? Parker Millsap is playing Duling Hall on April 11, the Creative Arts Festival "Art & Activism" happens on April 12 and 13 at Jackson State University; "The Office" Parody Dinner takes place at 1908 Provisions on Monday April 15; and the TechJXN conference beings on Tuesday, April 16, in downtown Jackson. Also, save the date for April 24, when Dialogue Jackson will host Lauren Stennis and Stennis-flag artwork at the Mississippi Museum of art. We're firming up details—visit dialoguejackson.com to learn more. At the JFP we're proud to be a part of informing you about the arts, events, music and the fabulous food you can experience as part of the Jackson experience. As the weather gets a little more accommodating, I encourage you to take advantage of these opportunities not only to have a little fun but, in most cases, to support local artists, local organizations or to lend your support to an important cause. Get out and smell those azaleas!